and scattered through with pearls. catching the light and turning to diamonds. It was not human, this creature." For more information, discussion for engagement requests or bookings please get in touch with me at my contact page. I am happy to answer to all of your requests. "What shall I say? I´m a classical mermaid. I constantly search for a human soul, desperately lose my heart, intensely suffer from curiosity, vainly look in the mirror, hopelessly wait for the prince but yet I gaze into the dry lands from afar. I would be doomed if I get marooned on an island of tedium." 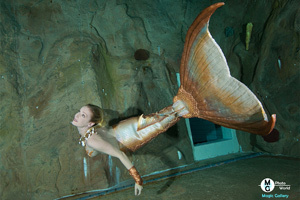 Hi, my name is Daniela Rodler and as well as my profession as a veterinary research scientist, I am a professional mermaid performer, underwater model and actress from Munich, Germany, who can be hired for TV and movies, aquarium, tank, photo, art, music video, commercial, exhibition, or special events, such as swimming with children at charity events. I´m very proud of my international mermaid appearances in several famous public aquariums across the globe such as SEALIFEs Munich and Hannover, Germany, DEEP SEA WORLD AQUARIUM Edinburgh and BLUE PLANET AQUARIUM Chester, UK, SILVERTON CASINO Las Vegas and DIVE BAR Sacramento USA , all of which have resulted in much acclaim as an underwater performer. I am a former competition swimmer, trainer and a PADI certified scuba- and apnea diver. Since 2008, I combined my diving, modelling, performing, dancing and acting experiences in order to realize people´s dreams and wishes for a magical and mythological creature. Hence, I felt the need to start "authentic movement training" of a true and credible mermaid. 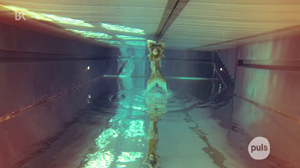 I am ambitious to represent this legendary being as realistic as possible as full-video presentations and therefore I have practiced over many years to gain a fluid, elegant and yet powerful way of diving. I have dared to step into the underwater world because I search for exactly this kind of challenge and new experience! So do come and meet me at special events at the Munich mermaid school or watch me perform at different national and international places! In open oceans, rivers, lakes, as well as aquariums I have freedived with marine animals including sand tiger sharks, lemon sharks, stingrays, sea turtles, whale sharks, seals, and others, so all that experience makes me confident about presenting a spectacular but also an animal friendly show. I love what I´m doing therefore magazines and newspapers have often written about my adventures. Moreover, I have recently become an author myself. 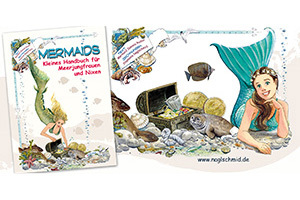 My book "Mermaids - Kleines Handbuch für Meerjungfrauen und Nixen", illustrated with beautiful handpainted images by publisher SNaglschmid, represents the first teaching handbook for young aspiring mermaids in the German-speaking world. Available at www.amazon.com. I was lucky enough to travel widely and have already done public mermaid presentations in many national and international waters (Germany, Lanzarote, England, Scotland, USA, Australia). I love working on foreign adventures that bring together different people with a similar passion, so I would be more than happy to participate in any overseas projects. I possess several professional mermaid tails with matching tops. I design and make most of my own mermaid accessories myself. 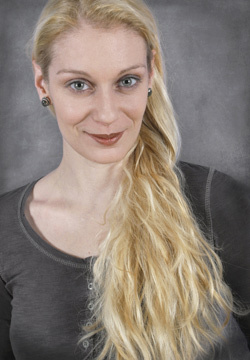 Additionally, I have often been told that my natural long flowing blond hair and ivory pale skin makes me look like a real sea nymph, straight from mythology. In case you want to shoot me without a mermaid tail, I can gladly offer my services as a highly experienced professional underwater model and - actress with a TV and ballet background. Protecting the animals, oceans and nature as well as special human charity projects have a priority in my mind so I have decided to work for free for handpicked organizations, events or shows. I would be happy to give you more information on this aspect of my work. 2017: Publication of our book "Mermaids - Kleines Handbuch für Meerjungfrauen und Nixen" with publisher SNaglschmid. I´m very proud to have written the very first mermaid teaching handbook in the German-speaking part. The book for aspiring young mermaids is especially magical because of the beautiful handpainted illustrations by Stephanie Naglschmid. Order your copy at: www.naglschmid.de and www.amazon.de. You could also use an order form for purchase, please see below. 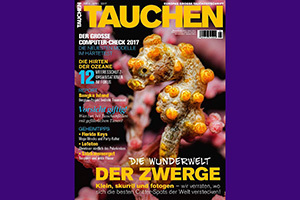 2017: The famous monthly professional diving journal "TAUCHEN" (no. 80) has published a 4-page interview with me about the joys and challenges that my mermaid life has in store. 2017: Various shows at annual mermaid days like the one at the Prienavera pool, Prien at Chiemsee, Germany. This event took place first time in 2016. This year’s proceeds went to a grayling-breeding project of the angler club Prien that campaigns for protection and habitat conservation of this endangered fish species. 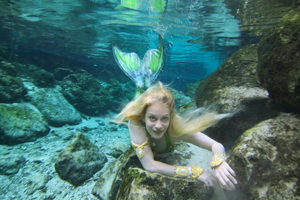 Also the WellenBerg pool Oberammergau, Germany, follows the lead and I was happy to perform there as pro mermaid and contest judge at the town´s first mermaid day. 2017: Movie shoot as mermaid narrator for an educational film production which broaches the issues of beauty and fictional characters. I report about the challenges of my mermaid role in conjunction with the today’s beauty concept that young girls especially have to struggle with. 2017: Easter mermaid shows at SEALIFE Munich. This time I was accompanied by Prof. Tracy Davis, University of Chicago, USA, who interviewed me for her publication about aquarium diving mermaid performers. Bavarian radio channel Bayern 2 took some impressions. 2017: Mermaid guest show at the aquarium of the famous Sacramento Dive Bar, CA, USA. Before that amazing event I was trained in new aspects of show diving and underwater acting by Dive Bar´s professional mermaids. A great honour and lots of fun! 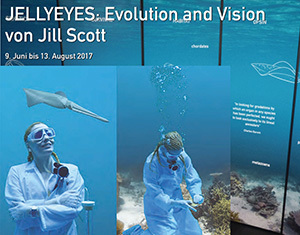 2017: Mermaid diving (hall 3, diving tower) at the world´s biggest watersport fair "boot 2017" in Düsseldorf, Germany, and lecture (hall 4, pixelworld stage) about mermaids in myths and modern times. 2016: Photoshoot as mermaid at a South German alpine lake with Munich photographer Nadja Ellinger for her project "But a mermaid has no tears" with subsequent exhibition at Provisorium Munich and book publication. The project deals with the story of the sad "Little Mermaid" (by Hans-Christian Andersen) whose ordeal at losing her voice and walking with legs is impressingly displayed in analogue photography. 2016: Mermaid show at my home aquarium SEALIFE Munich where I did a dive for its 10th anniversary! Together with Munich mayor Christine Stobl, director of SEALIFE Deutschland GmbH Jan-Malte Kistler, and Olympic Parc director Arno Hartung this traditional and beautiful aquarium was congratulated for its fitting fishy style. 2016: Mermaid show at the open air swimming pool event "Pirates at Königssee", Schönau, Germany. 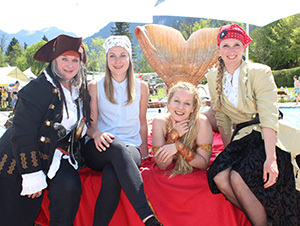 This spectacular and giant pirate party was organized by Jugend-Treff.5 chairwoman Heike Mechelhoff and the Schönau-am-Königssee tourism. The unique sunken-ship underwater decoration, arranged by the Yeti-Divers Wittlich, was more than terrific to dive at. 2015: Mermaid guest dive at the indoor dive centre Munich to support the distributor meeting of the scuba brands "Oceanic" and "Hollis". 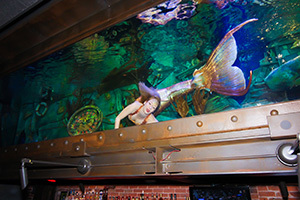 2015: Guest dive as mermaid at the famous Silverton Casino Aquarium, Las Vegas, USA. 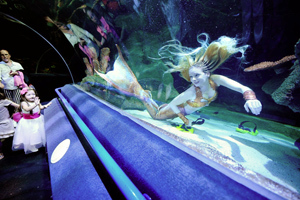 Silverton Casino Aquarium is the world´s second place (after celebrated "Weeki Wachee" Springs State Park, Florida, USA) that featured live mermaids for the first time ever. 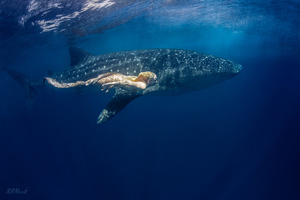 2015: Spectacular photoshoots with giant whale sharks in the open Caribbean sea and mystic underwater shots inside the sacred Cenotes of Mexico. It was a truly productive, professional and successful collaboration with three of the internationally best known underwater model photographers Chris Crumley, Robert Minnick and Susan Knight. An image of this shooting was chosen for cover photo at the Canadian magazine "Barnacle Babes". 2015: Mermaid action at the anniversary celebration of the tech diver´s professional magazine "Wetnotes". Submarine photoshoot and tech diver participation at the stone quarry lake Löbejün, Germany, with underwater photographer Joachim Lingelbach, Leipzig, Germany. 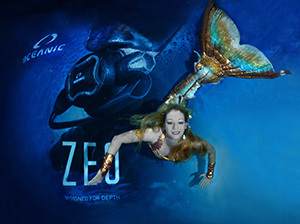 The company SeaYa advertised their professional underwater lamps by using a photo of this shoot. 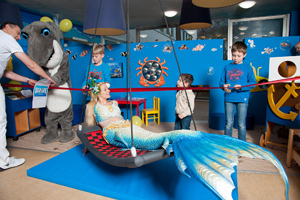 2015: TV article about a day in the life of a mermaid in the magazine "Wir in Bayern" (German TV channel BR). The camera captures my show dive preparations at SEALIFE Munich, all from packing my accesoires in the morning to the exit door at the end. 2015: TV appearance in the lifestyle magazine "taff" (German TV channel Pro7). I tell them how it should be like: The girls of "Germany´s Next Topmodel" and the students of the Munich mermaid school have to learn at underwater shootings how a real mermaid is supposed to perform. 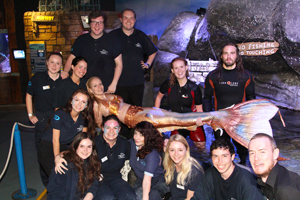 2015: 4K media project with producer Jo Mais and TVN Group at SEALIFE Hannover, Germany. I got to do this special kind of shooting technique and show up now at a 4K aquarium-with-mermaid screensaver! 2015: Mermaid photoshoot with the fantastic underwater photographer Uwe Schmolke at the dive tower Siegburg, Germany. 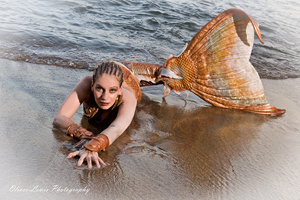 I´m proud not only of our images which show some hints of Atlantis but also of my second self-made silicone mermaid tail which was tested here for the first time. 2014: Dry mermaid gig at an annual event of Sony Music Entertainment taking place at the Eisbach Studios Munich. With a seafaring theme, a mermaid mustn´t be missing of course, and I had a lot of fun with this year´s stars of the music scene! 2014: What a wonderful home experience in autumn! I´m very proud to have pleased the visitors of the renowned Munich SEALIFE Aquarium, diving inside the great "ocean tank"! Reports on my dive were made by the German TV channels ZDF, BR and Sat1 and the newspaper "Münchner Merkur". Next to dealing with fantastic aquarium staff I was able to become friends with the nurse shark Bonnie, the guitar shark Angus and the sea turtle Gonzales. 2014: Photoshooting at a Caribbean beach with Grenada´s famous model photographer Oliver A. B. Lewis in St. George´s, Grenada, West Indies. 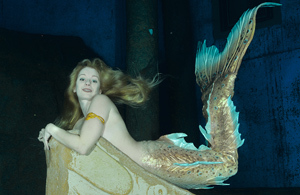 2014: "Scotland´s first mermaid" is back! Again this year I performed for several days in underwater shows with the big sand tiger sharks in the tunnel tank and the tropical "rock pool" of the Deep Sea World Aquarium Edinburgh, during the Edinburgh Festival in Scotland. 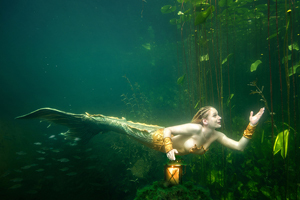 2014: River photoshoot as mermaid in the crystal clear waters of Three Sisters Spings, Florida, USA, with Captain Wayne White. 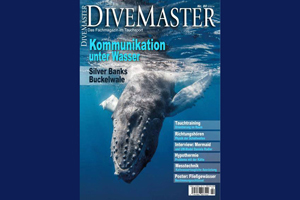 2014: The famous German quarterly diving magazine "DIVEMASTER" (No. 80) has printed a 4 page interview about my life and my experiences as an underwater model and mermaid. 2014: Performance as professional mermaid at German "Magictail Day 2014" filmed by the TV news show "Hallo Deutschland" (TV channel ZDF). This was my first opportunity to present my new self-made SPFX silicone mermaid tail with matching top in public. 2013 / 2014: Caribbean ocean photoshoot with Howard Clarke, chairman of the Grenada underwater sculpture park management. As apnea diving mermaid I give a visit to "Christ of the Deep", the old and new "Circle of children" (seen above), "Sienna, the praying woman" and the "Lost correspondent". They are overgrown with corals and wait for divers on their silent sea floor home. 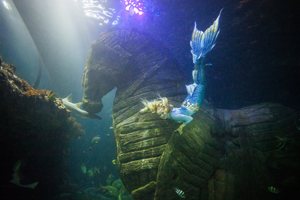 2013: Several performance shows as mermaid at the Blue Planet Aquarium Chester, UK, together with big sand tiger sharks and stingrays in the tropical underwater tunnel main tank (Caribbean reef exhibit). 2013: Performance as professional mermaid at the "1st German mermaiding day" filmed by the TV channels ZDF / KiKa. I gave an interview, answer questions and was a judge for the "Young mermaid talent contest 2013". 2013: Mermaid performance at the 75th anniversary of the public safety divers of the Munich municipal fire brigade. 2013: Photoshoot with Michael Goldschmidt, chief editor of the famous German online dive magazine www.unterwasserwelt.de, at the indoor dive center Munich. 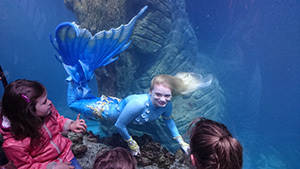 2013: Several performance shows as mermaid at the Deep Sea World Aquarium Edinburgh, UK, together with big sand tiger sharks in the underwater tunnel main tank (main exhibit), filled by local very cold Scottish sea water. 2013: Guest performance as mermaid in the tropical tank (coral reef exhibit) of the most renowned public aquarium in Denver, USA. 2013: Charity event "In touch with a mermaid" where mentally disabled young divers had the chance to swim with me as mermaid. Organized by the dive school "Yeti divers Wittlich" and the adults association for disabled children (registered society), at Vitellius public pool, Wittlich, Germany. 2013: Little mermaid show in the red mobile tank of the Munich municipal fire brigade at the outdoor, travel and dive mess "f.re.e Munich", Germany. 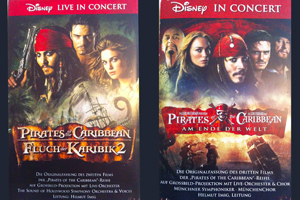 2013 / 2014: Acceptance to sing in the small choir cast at the original movie symphony concert "Walt Disney's Pirates of the Caribbean 2" (2013) and "Pirates of the Caribbean 3 - At world´s end" (2014) with five shows in April 2013 and April 2014 in the Munich Philharmonic, Germany (conductor Helmut Imig). I admit, this is a rather "dry event" for an underwater model but at least a wonderful opportunity to use my singing voice in a mermaid related theme. 2012: Diving as Christmas angel and mermaid for the charity event "Christmas under water" held by the Yeti Diver´s school, Wittlich, dedicated to the German Red Cross´ work for disabled children. 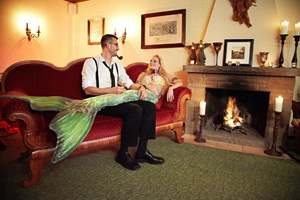 2012: Corporate video as mermaid and model for the "fairy tale hotel" Bernkastel-Kues, Germany. 2012: Cast for a wonderful role in the independent movie "T = E/x²", directed by Andreas Z. Simon, Wiesbaden, Germany. Starring: Jasmin Wagner and Mario Ganss. 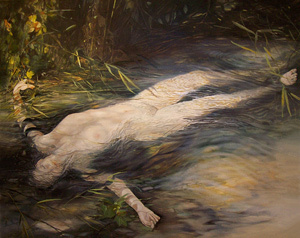 2003-2004: Acting as a model (here: "Ophelia"; location: Munich river Isar) to the famous German oil painter and film/opera stage designer Henning von Gierke, Munich, Germany. This oil painting is listed in his book "Goldener Strom", Prestelverlag 2009. 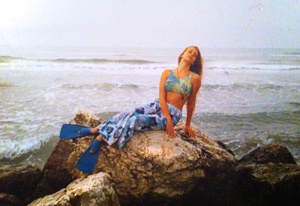 1994: First mermaid shooting at the Caorle beach, Italy. A long lasting dream: Freediving with giant lake sturgeons at the beautiful natural pond site Naturagart Ibbenbüren, Germany. It happened and I was able to visit the amazing underwater sculptures and temples. This clip shows some of my impressions and adventures that I won´t forget for a long time! Beauty is in the eye of the beholder, but is at the same time measurable. It is surrounding a fleeting ideal and us. The movie shows how beauty is scaled and evaluated, and displays its transformation in fashion and art over the years. My role is to explain the fictional character "mermaid" to the audience. The mythologic creature "mermaid" has always generated images, demands and dreams in people and therefore contributes a lot to this fascinating theme! What a show night! I get the chance to wave my fins at the illustrious Dive Bar Sacramento, USA. What´s more, I was trained many underwater tricks by the lovely and famous Dive Bar mermaids and the guests had a very entertaining evening. Unforgettable and unique! "boot 2017" in Düsseldorf, Germany, the world´s biggest watersport fair! Sorry, but ingenious! I enjoy my time at the diving tower and hold a lecture about mermaids in mythology and modern times. Additionally I introduce our newly published handbook for little fishies "Mermaids - Kleines Handbuch für Meerjungfrauen und Nixen". The famous "boot" fair was and will always be THE mega event of the diving scene! Many colourful mermaid tails - and me in the middle! 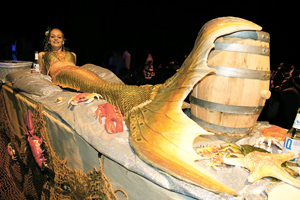 A television crew accompanies my show at this fantastic event and interviews me about some aspects of my mermaid life! A wonderful day, which really fills the Prienavera pool with fishy fins! Here I can just give my best wishes and congratulations! And of course I have to be present when my home aquarium celebrates its 10th anniversary! 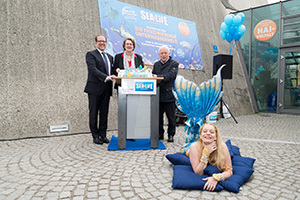 Munich mayor Christine Stobl, director of SEALIFE Deutschland GmbH Jan-Malte Kistler, and Olympic Parc director Arno Hartung visited this fantastic aquarium at its great day and joined the fishy party! There´s nothing better than diving next to a beautiful giant whale shark! This surely is a highlight in my mermaid life! And since I even get to shoot in the amazing crystal clear freshwater caves in Mexico with three of the most renowned underwater model photographers I couldn´t have done better than catching this magic forever in a video clip! To perform in Las Vegas once in a lifetime! This dream comes true for me as I have the opportunity to show dive as a guest mermaid at famous Silverton Casino Las Vegas, USA. To watch this little video, shot by my safety diver, returns all the sweet memories! I´m so excited and happy to work together with the Germany-wide famous band "Münchner Freiheit", based in Munich. This video shows a first result of this collaboration. In its special edition of the hit song "Meergefühl" ("Ocean feeling") it combines hot summer beats and cool sea shots. Be sure to watch it! A day in the life of a show mermaid! Who closely wants to experience what it takes to prepare for an underwater event, is exactly right at this TV report. Authentic, private, and unsealed I present my preparations for a show at SEALIFE Munich. A beautiful report about the "stumbling blocks" in underwater modelling. What supposed to look so easy on me as a pro mermaid, the girls of "Germany´s Next Topmodel" as well as the students of the Munich mermaid school still have to fight very hard for. But: Never give up! "The magic cube and the shark tank": I help moderator Sebastian to win a bet. He has to put together a Rubik´s cube. Underwater! To make sure he has enough air for doing this, I teach him apnea techniques. Will he win the bet? 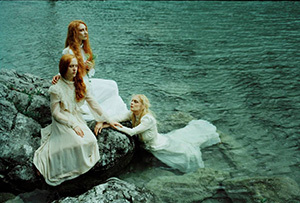 A report about professional mermaids and wannabes in Russian television! Being mentioned together with famous Australian pro mermaid Hannah Fraser is better than wodka! 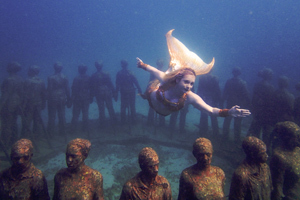 "Extraordinary job – diving as mermaid": The German TV lifestyle magazine "ML mona lisa" highlighted my double career both as a scientist and a mermaid. A life between two worlds, but only both of them make my life complete! "Mermaid and Sharks": The German TV channel BR provided a remarkable report about my adventures and experiences as a mermaid and shot me diving with sea turtle Gonzales and various sharks at the Munich SEALIFE Aquarium. 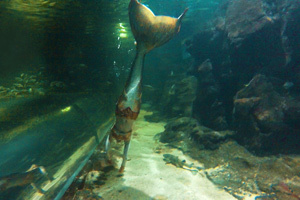 "Mermaid enchants Bavaria": The Bavarian regional news reported about my first public show dive at Munich SEALIFE Aquarium. 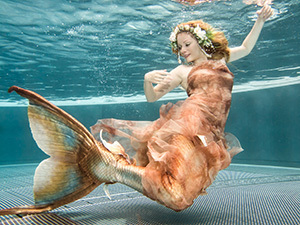 A very special and playful mermaid video shot at a renowned public aquarium in the USA. It was originally thought to be a mermaid diving showreel. But I have never had a better experience with nurse sharks, stingrays and huge fishes. It was the first time that I was able to call a sea turtle my real friend! Simply the best thing that could happen to any mermaid! KiKA moderators Ben and Jess attended the "Most talented young mermaid contest 2013" at the 1st German Mermaiding Day in Bad Wiessee, Germany. As an invited professional mermaid guest I worked as a judge, swung my fins for a little show and gave an interview. Pure fun! 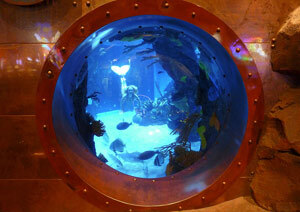 A small video clip made by the Deep Sea World Aquarium Edinburgh. It expressed sincere appreciation for my underwater appearance and is also a delightful memory of my Scottish National Aquarium days! As publicly announced "Scotland´s first mermaid" I was especially honored to dive together with seven sand tiger sharks in the main tank of Deep Sea World Aquarium Edinburgh, UK (Scotland´s National Aquarium). It was challenge and joy to enchant their visitors for several days. An exciting adventure in the nordic icy sea water, filmed by my wet-suited safety divers! A video about my mermaid performance at an affectionate and extensive charity event for mentally disabled children which was also visited by healthy children, divers and guests. It was hosted by the Yeti Divers Wittlich, Elternkreis behinderter Kinder e.V. and other sponsors and was located at the Vitellius public pool Wittlich, Germany. Main organizer Werner Lamberti was decorated by the German initiative "Respekt", an organization fighting racism and discrimination. A small view into my photo- and video shootings in 2012. Shooting places were the Caribbean Sea off Grenada, West Indies, the Atlantic off Tenerife, Spain and a public pool in Bernkastel Kues, Germany. Have fun to watch this colorful mixture of my underwater adventures! It always takes hard work and lots of preparation, but I simply love this job! It´s an old habit to dream of the ocean. But I don´t dream of it, the sea is my home. I dream of somebody. You meet someone, you dance and you always hope that it would be forever… (This is a video project I directed, acted in, composed music with the opera singer and mentor Andreas Kohn and arranger Peter Schmid, and sang some of the siren sounds). ...of course with all participants like Santa Claus, Santa's servant Ruprecht, Christmas divers, and me as mermaid. Little Christmas video clip, dedicated especially to my underwater collegues. TV report about the charity event "Christmas tree under water", organized for the benefit of the German Red Cross´ work for disabled children in Bernkastel Kues, Germany. I performed as an underwater Christmas angel. This German independent fantasy movie with the exeptional title "t=E/x²", directed and written by Andreas Simon, deals with the matter of time and the problems with it. Two people, trapped in a time warp have to learn to extend time and therefore become savers of the time base themselves. Estimated release will be in 2015. Sounds complicated? It is. But if it was easy to explain no movie would be neccessary. 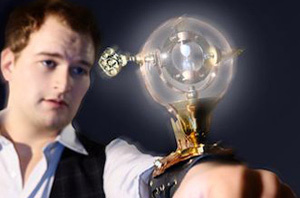 Director, actors and team have only one goal: to make a fantasy movie that differs.